Where do you go when it's late and hunger strikes? Hopefully not the drive-thru of the closest fast-food chain, you're better than that. 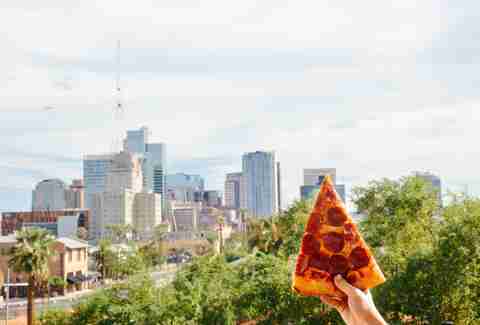 While Phoenix's late-night food options have been slow coming, we no longer have to scour a fast-food menu to cure late hunger pangs. When it's late and the bars are closing, or if you're headed out for a late, like really late, dinner, these are your best options across The Valley. Because you deserve more than a sad cheeseburger from the dollar menu. We're thankful for the following places -- and are crossing our fingers that some of our other favorite restaurants will start offering extended hours. This Camelback rolling taco stand might just have the best deals on tacos, both chicken and beef, in the entire Valley -- you can get 'em for just a buck! It's likely that there will be a line, but these tacos are worth the wait. Grab a seat outside and stay awhile. You might just end up getting back in line for seconds. Taqueria Los Yaquis is open Thursday through Saturday until 2am and on Sunday until midnight, so you can get your taco fix when hunger calls late at night. Closed Mondays but open from 5pm to 2am every other day, this Garfield neighborhood diner turns out comfort food in a red-and-white, 1940s-style Valentine diner that seats nine. Space inside is tight, but not to worry, there's plenty of space outside on the patio underneath the string lights for you and your late-night crew. We recommend the fried chicken biscuits, like the Big Jim or Bumblebee, but a plate of poutine for the table isn't a bad idea either. Open until midnight on weekends, CRUjiente Tacos, or CRU for short, just opened up, but is already making a name for itself as a late-night eats must-stop. This isn't your typical drinking food -- you'll find a range of tacos from duck and Korean fried chicken, to blue crab and ahi poke. And we can't forget the impressive 36-hour beef short rib taco. The Arcadia spot also offers a pretty solid lineup of spirits, from tequilas and whiskeys to wine and beer, if you want to keep the party going. Sometimes what you need to fill that empty space in your stomach is a big, greasy hamburger. And lucky for you, you can get just that at Phoenix's Delux Burger until 2am every single day. 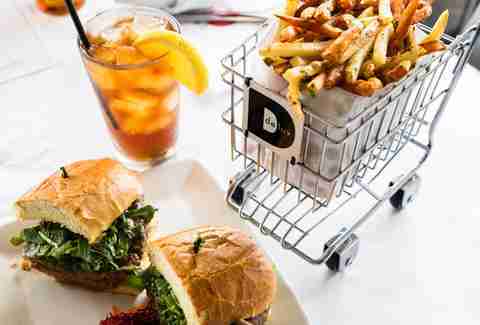 Whether you get the Delux Burger with caramelized onions, a selection of various cheeses, and bacon, the Classic, or the Delux Duo (that's two mini-burgers), you're going to want to order yourself a basket of fries. There's also more to the menu than burgers. Bruschetta, salads, soups, and sandwiches are also available, but we're betting late at night you would opt for a burger. Open each night until 12, Cocina 10 is your Downtown destination for late-night eats. With a spread described as "Mexican-accented road food" put together by the creative minds of food geniuses like Chris Bianco and Doug Robson of Gallo Blanco, it's hard not to find something on the menu worth ordering. The 1-10 Nachos (refried pinto beans, sharp Cheddar, cotija, and Oaxaca cheeses, and guacamole) are a great start. Follow up your chips and fixings with something like the Sonoran dog, mix-and-match tacos, barbacoa burrito, or chicken tinga torta. Your stomach will be grateful. Pizza might not be able to solve all of your problems, but it can solve your hunger and your potential hangover. Grand Avenue Pizza Company exists to solve the latter, and it's closed on Sundays and Mondays but open until 4am from Tuesday through Saturday. Order inside at the counter and find yourself a seat outside on the back patio. There are tables for both large and small groups, plus a section for inside diner-style seating, although tight, inside. From classic pies to custom and vegan options, you can get your fill of pizza until your heart's content, by the slice or whole pie. Founded by Cornwall, England native Dean Thomas, this is The Valley’s most viable option for real, classic pasties and its doors are open until midnight seven days a week. The Oggie is your best bet for a filling taste of Southwest England fare; the signature pasty is stuffed with steak, potatoes, onion, and rutabaga and served with a side of red wine gravy. 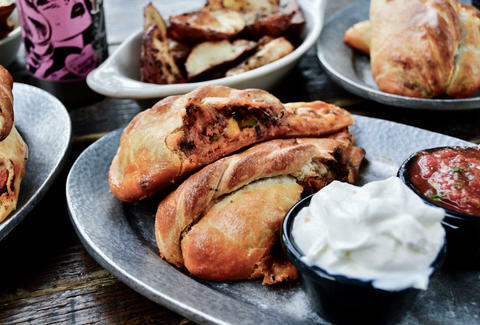 More hand pies worth mentioning include the Bangers and Mash, Lamb and Mint, and the Mexican. 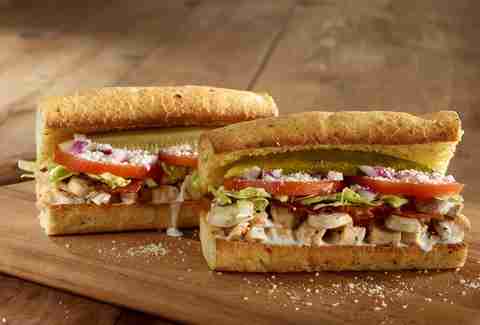 There's even a veggie option for all of you non-meat eaters out there. 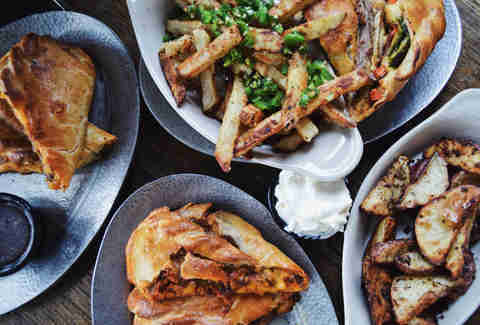 And of course, you can't get a pasty without a side of chips or roasted potatoes. This sandwich shop has got locations throughout the country, but it was founded right here in Tempe. Open until midnight on weeknights and 2am on weekends, Cheba Hut deals out over 25 different toasted sub options, and the shop is just a quick ride-share or bike ride away from the center of the university. With names like Magic Mushroom, Sticky Icky, 5-0, and Dank, it's hard not to chuckle. The subs are available in "nug," "pinner," and "blunt" sizes that range from 4-12in, depending on your appetite. You've also got to pick up a Rice Krispie bar to go. This Tempe spot is just steps away from Mill Ave and can serve to satisfy your hankering for pub fare until 1am. Fried clam strips, calamari rings, and potato skins are always solid options for the table. And if you do choose to partake, oyster shooters are on hand. The oysters Rockefeller are a winning choice and come topped with spinach, bacon bits, and a big pour of house sauce. Open until 2am daily, Scottsdale's Pig & Pickle slings good-quality "drankin" food. 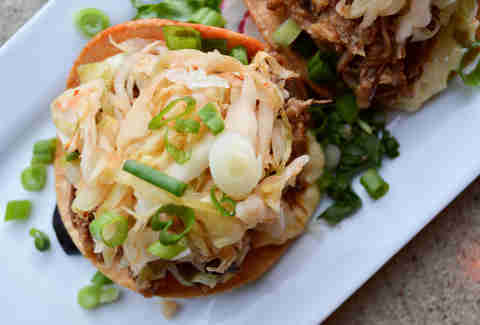 The late-night menu contains some creative takes on traditional dishes, like the pork tostadas which flip a normal tostada on its head because they are covered in kimchee. There are also late-night essentials like burgers and duck-fat fries, as well as noodle dishes, bánh mì, roasted Brussels, and wood oven-roasted bone marrow. 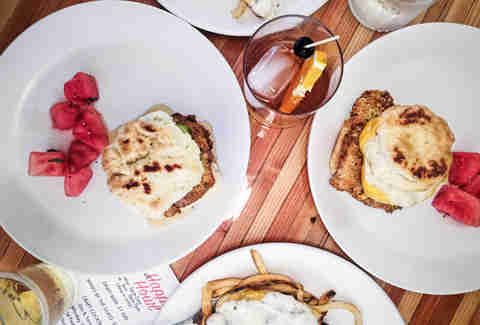 Pig & Pickle is dynamic; it's not just a destination to hit after you've torn up the bars, it's also a good place to start a night out or spend Sunday (read: hangover) brunch. This order-at-the-counter joint has a picture menu to make it easy for you; just order by number if your Spanish isn't that great. 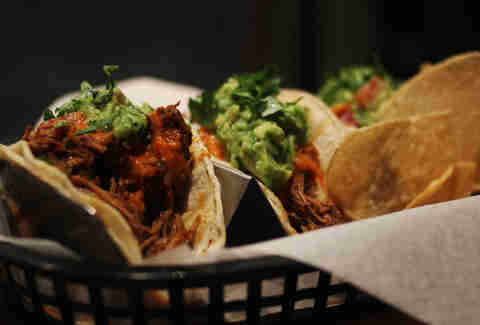 We recommend the carnitas tacos over everything else. The sides, think fried rice and refried beans, aren't the best in Phoenix, but the restaurant has been in business for over 20 years so it's doing something right -- it's still fun to use your chips to scoop it all up. 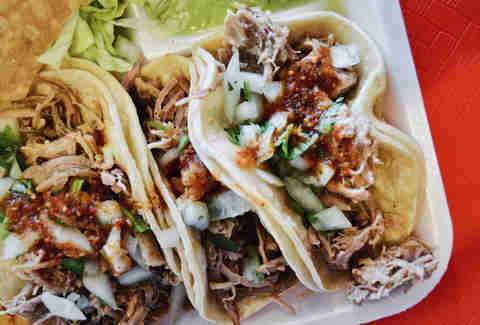 If you find yourself here, Tacos Jalisco is open until midnight every day. AZ/88 is Scottsdale's "modern saloon" -- because this is Scottsdale. But you won't find cowboy paraphernalia or rattlesnake on the menu. Here, in what is essentially the heart of Old Town, you can find award-winning cocktails and an artistic ambience that pairs nicely with the upscale-yet-hearty cuisine. The kitchen is open until 12:30am seven days a week and serves a wide-ranging spread of food, from shrimp cocktail and water chestnuts to burgers and wings. If you're searching for a bar that serves Chinese, Chop & Wok is the place of your dreams. 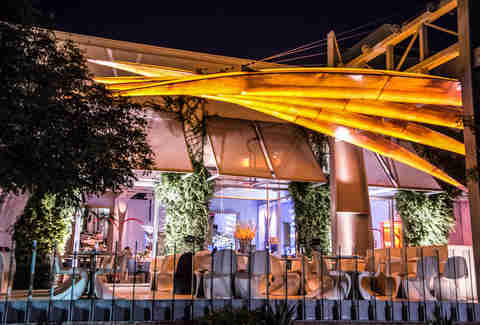 Here at the long-standing Scottsdale resto, which is open until 2am every day, you can expect to find traditional Chinese-American eats like chop suey, sweet-and-sour, kung pao, lo mein, and hot-and-sour soup, as well as wonton and egg drop soups plus apps like pot stickers, crab puffs, and BBQ ribs. Oh, and it has karaoke. EVO's kitchen is open until 1:30am daily, which is good news for you. The Scottsdale spot, which is near Old Town's bars and clubs, is a welcome change from the bass-bumping, uber-crowded places that are just a few blocks away. Here, you'll find Italian food -- including a number of pastas, pizzas, and grilled dishes -- served in a comfy-cozy setting. 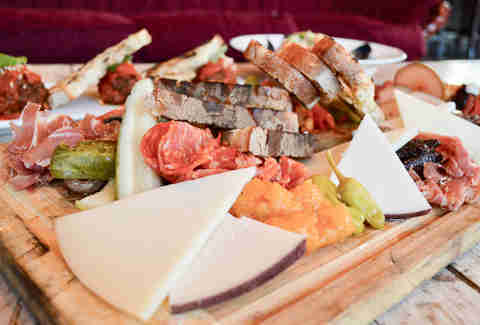 If you find yourself here with a group, we recommend the shareable charcuterie board. Lauren Topor is a Thrillist writer who has admittedly gone through the drive-thru after the bars have closed. Forgive her, follow her to better decisions on Instagram, and tag your late-night food photos #hungryinphoenix.